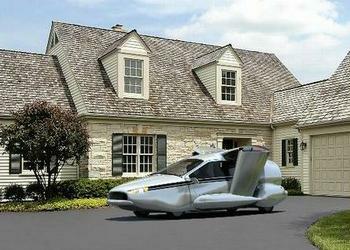 WOBURN, Massachusetts, May 8, 2013 (ENS) – An American company on a mission to build practical flying cars has begun feasibility studies of a vertical takeoff and landing plug-in hybrid electric flying car, the TF-X™. Terrafugia, Inc., developer of the Transition® street-legal airplane, is developing the TF-X plug-in hybrid as a fixed wing street-legal aircraft with electric ground drive and electric power assist on takeoff and landing. The TF-X seats four in comfort and drives like a normal car, using two electric motors and a turbine engine. It will fit into a standard construction single car garage. The TF-X will be able to take off vertically from a level clearing of at least 100 feet in diameter. With a a non-stop flight range of at least 500 miles, the hybrid flying car will be able to fly in either “manual” or “automatic” modes between approved landing zones or airports. Building on the company’s experience with the Transition plane, designers have coupled vertical takeoff and landing capability with highly reliable electric motors and custom-made quiet rotors. The TF-X will be able to recharge its batteries either from its engine or by plugging in to electric car charging stations. “This is the right time for us to begin thinking about the future of the company beyond Transition development,” said Terrafugia’s Carl Dietrich, who serves as both CEO and chief technical officer of the company. 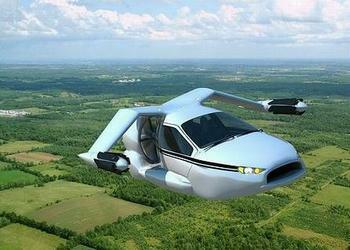 On October 27, 2012, Terrafugia engineers demonstrated the Transition flying car for the first time to 300 employees, customers, investors, FAA and other government personnel at Lawrence Municipal Airport. Chief Test Pilot Phil Meteer put the vehicle through its paces, demonstrating the Transition driving, converting and flying – and then converting and driving again. The Transition serves as a Proof of Process for TF-X development and commercialization owing to the many technical, regulatory, and usage challenges it has overcome. “Preliminary conversations with the Federal Aviation Administration about the TF-X concept have demonstrated their willingness to consider innovative technologies and regulatory solutions that are in the public interest and enhance the level of safety of personal aviation,” said Terrafugia. In 2012, Dietrich closed a $2.7 million Series D1 investment round, and Terrafugia successfully completed its contribution to Phase II of the DARPA TX program with the delivery of three-quarter scale hardware and test data. In the meantime, Terrafugia Chief Operating Officer Anna Mracek Dietrich has been participating as an industry representative on the FAA Aviation Rulemaking Committee to analyze and provide recommendations for the revamp of Federal Airline Regulations governing airworthiness standards for airplanes in the normal, utility, aerobatic, and commuter categories. She says this process has given the company insight into the evolution of the light aircraft certification process. As the Transition program shifts from research and development to certification, production, and customer support activities, the company is moving towards production, although a production date has not been set. In 2012, the Transition order backlog topped the 100 customer mark and now represents roughly US$30 million of product. Terrafugia (terra-FOO-gee-ah), based in Woburn, is an aerospace company founded by pilot-engineers from the nearby Massachusetts Institute of Technology and supported by a network of advisors and investors. The company name is Latin for Escape the Earth.